THIS CAR IS BRAND NEW..NEVER TITLED.2018 FORD MUSTANG..LOADED..SYNC3..REVERSE SENSING..REAR CAMERA..FULL WARRANTY..BEST BUY!!..New. 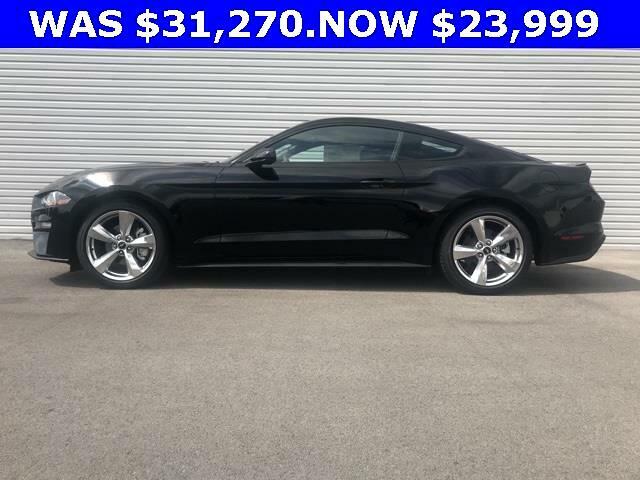 EcoBoost, 2D Coupe, EcoBoost 2.3L I4 GTDi DOHC Turbocharged VCT, Shadow Black, AM/FM Stereo w/Single CD/MP3 Player, Body-Color Blade Decklid Spoiler, Cloth Bucket Seats, Dual-Zone Automatic Temperature Control, Equipment Group 101A, Exterior Parking Camera Rear, Fully automatic headlights, Power windows, Remote keyless entry, Reverse Sensing System, SiriusXM Radio, SYNC 3 Communications & Entertainment System, Wheels: 18" x 8" Machined-Face Aluminum.Priced below KBB Fair Purchase Price! At Kerns Ford Lincoln & Truck Center, whether you've got great credit or bruised credit, we have the car / truck / SUV / van for you. We believe in Live Market Pricing to ensure our prices are very competitive and minimize the back and forth negotiations that most shoppers aren't big fans of. Give us an opportunity to earn your business -- you'll be glad you did!Odometer is 13931 miles below market average!Have you Experienced the KERNS COMMITMENT? CALL, EMAIL or STOP-IN Today and see why we are Auglaize and Mercer counties #1 Volume Used Dealer. 2 Great Locations in ST. MARYS and CELINA to serve you. 1-888-367-3856.